The scaffolding reaches into the thoroughfare and has been called "an eyesore". Businesses are worried a burnt-out building held together by "excessive" scaffolding in Northampton town centre will stay that way "for years" if action is not taken. The second-hand store at the top of Abington Street was destroyed in a blaze in June. The burnt out building in Abington Street is now held up with "excessive scaffolding." Earlier this month, scaffolding was erected to secure the gable - but is so extensive it has meant that half of the high street's thoroughfare has been closed off. Meanwhile, a portion of York Road which runs alongside the damaged building remains closed. Now, nearby businesses have called the scaffolding "an eyesore" and fear it will further put customers off from visiting the town centre. John Sheinman, of Sheinman opticians, said: "It's a disgrace and I'm very concerned. We are now nearly invisible from the top of Abington Street. Our patient flow has been reduced and the fencing reaches into the road. Business owners nearby have called the scaffolding "an eyesore" and a "disgrace". "This will have a major repercussion on the town centre." The fire in June, which caused many buildings nearby to be evacuated, so far remains "unexplained" according to Northamptonshire Fire and Rescue. Steffan Suter, owner of Steffans Jewellers, said: "There must be a way to brace it from the inside. If there's another fire in Abington Street, they won't be able to get a fire engine for an ambulance past that scaffolding. "I worry kids will use it as a climbing frame in the summer holidays." One business owner is concerned that fire engines and ambulances will not be able to access Abington Street with the scaffolding in place. It comes after plans to renovate the Angel Hotel in Bridge Street are only now making progress five years after the building was hit by a fire in 2012. Daniel Granger, owner of the hairdresser of the same name, said: "This is the heart of the town centre but this the damage is the first thing you see coming off of Wellingborough Road. "I hope they can build a box covering to hide the damage and make the street a little prettier. Businesses could advertise on it too." 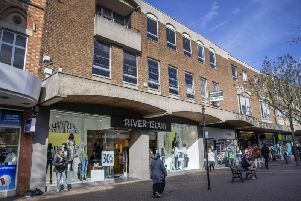 A Northampton Borough Council spokeswoman said: “We have every sympathy with neighbouring businesses and are doing all we can to bring about improvements as quickly as possible, including notifying the owner of their responsibilities and ensuring the building is safe.